SAO PAULO, BRAZIL — Amazing! Astonishing! Breathtaking! These are some of the adjectives heard referring to the opening of the Guadalajara Pan-American Games. Oct. 14, 2011 - Guadalajara, Mexico - Opening ceremonies of the 2011 Pan American Games held at the Omnilife Stadium in Guadalajara. It is really a privilege to be watching this event, even if I am watching it on TV, comfortably sitting on my sofa at home, in São Paulo. 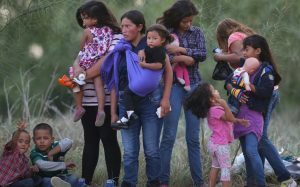 Thousands of miles away from Central America. The high performance of all the athletes (almost 6,000) and the high level of the competitions is remarkable. It is really a beautiful event provided by Mexico. 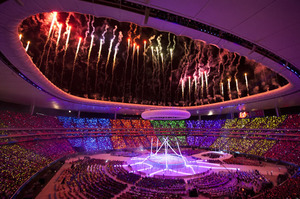 Opening ceremonies for the 2011 Pan Am Games in Guadalajara, Mexico. But what amuses me most, of course, is to see the Brazilian athletes accomplishing their goals and performing with such good results. It is good to see, and show, that Brazil is not all about soccer. It is volleyball, tae-kwon-do, swimming, gymnastics and many others. We know we still have a lot to learn, but we are getting there. I here praise all the 42 countries that are represented in Guadalajara and congratulate Mexico for organizing this amazing, astonishing, breathtaking Pan-American Games Event. Born and raised in Sao Paulo, Brazil, Edy has been a world traveler since the age of seven. In the process, she mastered several languages including English, Spanish and Italian. Her love of languages lead her to a speech therapy degree. These days, this divorced mother of three successful young adults, oversees her own business, an English school in Santos, Brazil. Located on the coastline, the school serves as an outlet for Edy to use her training as a speech therapist to teach English to such students as Brazilian business executives. In addition to owning her own business, Edy plays on a volleyball league for women over 30-years-old and took up riding motorcycles. Already on her second bike, Edy enjoys the speed of the ride and is proud to have been allowed to ride the Interlagos race track, home of the Formula One Brazilian Grand Prix.